Theraworx Protect Foam Application from HealthyKin.com is designed for the intermittent catheter patient. When used with Theraworx Protect's patented protocol indicated for the prevention of catheter associated Urinary Tract Infection (UTI), has been shown to be effective. Theraworx Protect is simple and safe, and can help you in your quest to maintain a healthy lifestyle. 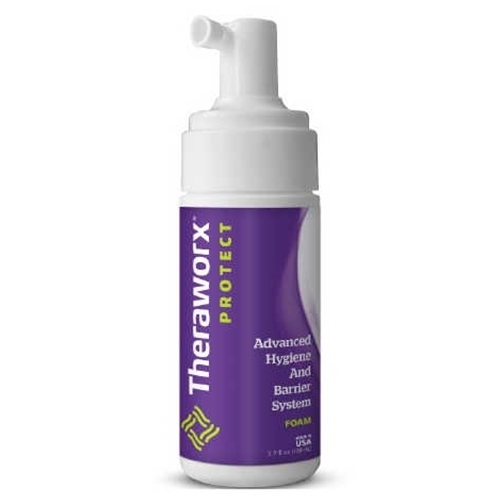 Theraworx Protect's patented formulation supports and maintains the skin’s natural antimicrobial and skin integrity functions, while providing a clinically proven, safe, highly effective, non-toxic and non-rinse option. Excellent concept with great potential for catheter users. However the formulation contains two forms of parabens and it's likely that with longterm use contact sensitivity will develop in susceptible patients limiting long term use in many patients. Benzalkonium chloride might have been a better choice as a bacteriostatic agent. This is a great product! Such a great clean scent. Not irritating at all. Cleans very well. Product arrived quickly. I will purchase again in the future. Great service, and excellent product. Awesome,a miracle product. It worked, and pain was gone almost instantly,in hip, thigh and knee. I can now put weight on the leg and stand and walk without pain or fear of falling. Product purchased for my father who is unable to toilet himself. We first came to know this product at a facility my dad was doing rehab at. The facility uses it as a barrier for people who cannot toilet themselves so there is no tissue breakdown. It works great. We are now ordering it for use at home as a protective barrier. Healthy kin does a great job getting the product to us in a very timely way. Also their price is very reasonable. Product arrived as described and in a timely fashion. Thanks!